Every time I make a mexican recipe my family seems to go nuts for it. We love Mexican food and we also just love tater tots. They are always good no matter how I make them. Today I decided to marry the two. I wanted to make enchiladas but really wanted to spice them up a bit so that we can have something different for dinner. 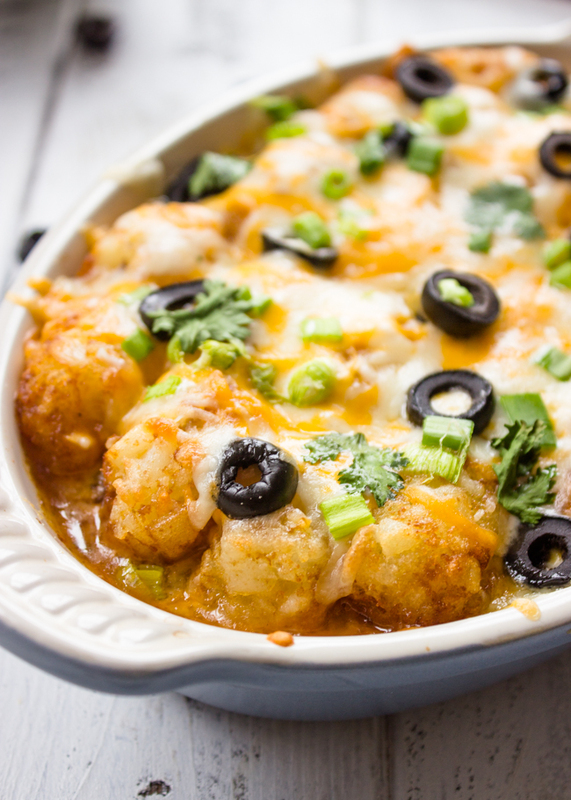 Instead of the tortillas I used tater tots and boy was this bake good! Making this casserole is very fun and easy. For the bottom layer I sauteed the beef and then added the enchilada sauce. I didn’t cook the beef all the way through because it will still bake in the oven for about 15 minutes. 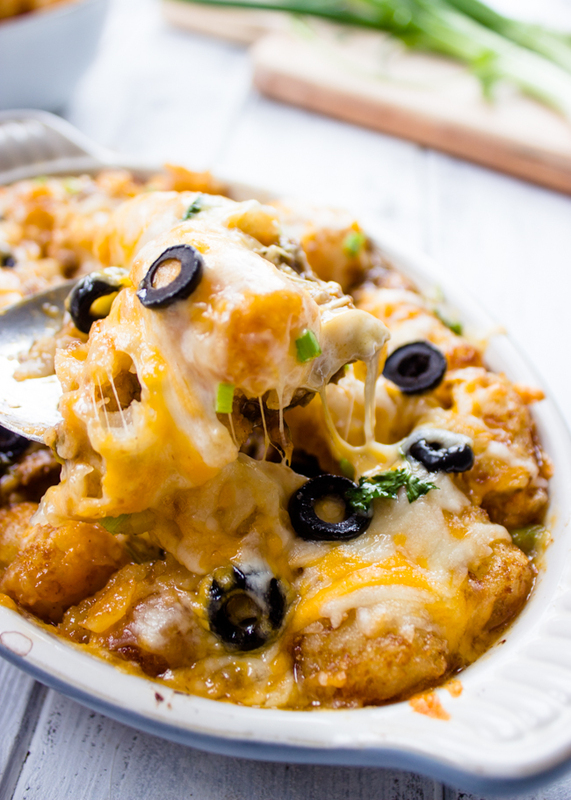 I then poured the beef enchilada mixture into the casserole dish and lined the tater tots on top and then topped it with a Mexican cheese blend. Then pop it in the oven and cook for about 15 minutes. I garnished it with olives and scallions but they are not mandatory. Then once it’s nice and bubbly and melted-cheesy, pull it out. Top with some green onions or cilantro for extra color. Add the oil to a skillet over medium heat. Add diced onions and garlic to skillet. Cook until just tender. Remove to a bowl and set aside. Add beef to skillet and cook until completely browned, add 1/2 pack of taco seasoning and cook for another 2 minutes. Remove from heat and drain away any drippings. Add onions and garlic back to beef and stir to combine. Pour the can of enchilada sauce into the beef and continue cooking for 2-3 minutes. Transfer the enchilada mixture from the skillet into a 9-by-13-inch baking dish. Scatter the tater tots on top. 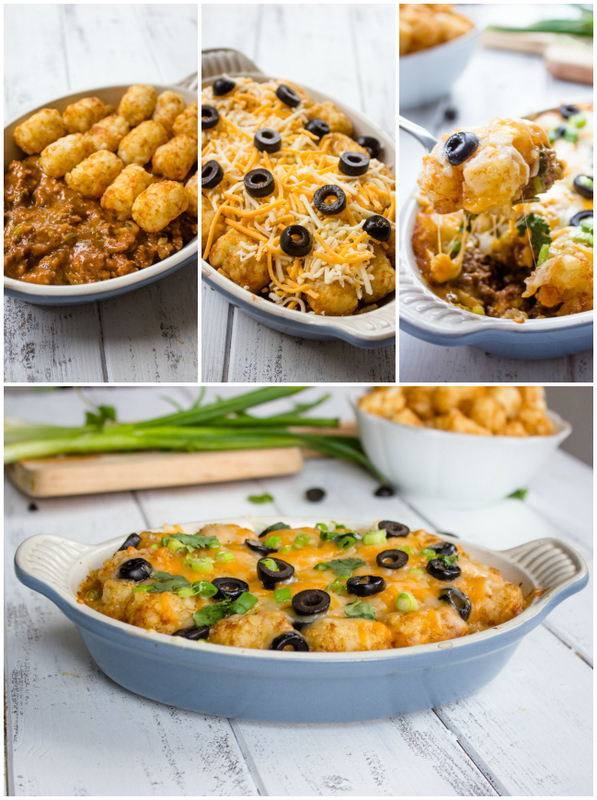 sprinkle the cheese and top with black olives.Bake uncovered for 15-20 minutes or until the cheese is bubbly and tater tots are golden brown. Garnish with scallions or cilantro for added color. Serve warm while the cheese is gooey! 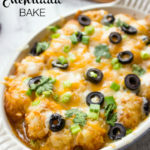 What size can of enchillada SAUce do u use for the tater tot enchillada bake? I made it tonight. I used a 16 oz can enchilada sauce, 3/4 package of taco seasoning, 2 cups of cheese, baked at 450 for 12 minutes after adding tater tots then added cheese and olives and baked another 12 min. Topped with sour cream and salsa. Tasted great! Could you use hash browns instead of the tots? Thought I would share that version, so you would know that I made sure to give credit where credit is due! I made this tonight with a full packet of taco seasoning per all the comments and thought it was too much. Would only use half next time. I also added a can of black beans with the meat and onions. Does anyone happen to have the nutritional facts for this? Thanks! How awesome and delicious… Thank you. I made this tonight & used 16 oz of enchilada sauce. My husband said it needed more, but I thought it was sufficient. I also used ‘crispy crown’ tater tots instead of regular sized tater tots & put the casserole in a 9×9 pan. I hope this helps. It was a great recipe & my family enjoyed it. I made this tonight after finding the recipe on Pinterest. 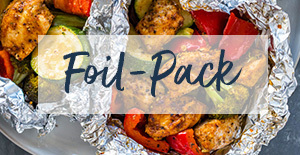 I followed the recipe with the exception of adding a whole packet of taco seasoning, instead of just a half packet as called for in the recipe. 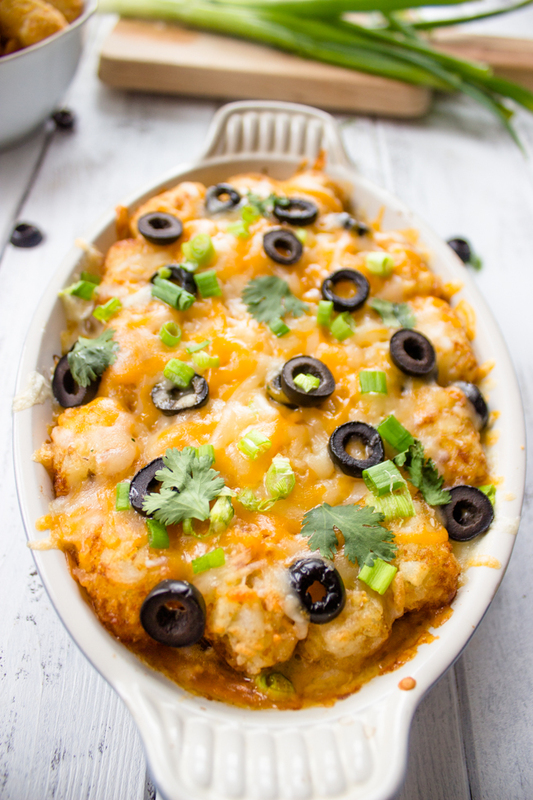 This is the best tater tot casserole I have ever had! It reminds me of a taco baked potato that I get frequently at a local restaurant. I will for sure be making this again soon. Thanks so much for the new twist on tater tot casserole! I made this tonight and it came out great. I used a whole pack of taco seasoning. I also put it in at 450 without cheese for 12 minutes first, since that’s what the tater tot package instructions were, then I put the cheese, brought the oven down to 350 and baked for 10 more minutes. It was DELICIOUS! Ah, such a great comment! I knew my oven wouldn’t cook the tots through and through in the given time, but didn’t know what to do about it. Thank you for this information LaNeshe!! Only 1 lb of hamburger in a 9×13 baking dish? That doesn’t even cover the bottom. 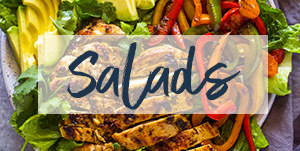 The pictures you included with this recipe surely aren’t showing a baking dish that big! It does if you eat like a normal person and not like Honey Boo Boo. We tried this last night and it came out amazing!! my husband and kids loved it and finished the entire casserole. I just have one problem… I wish I made more! will be making this again soon. 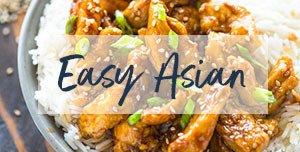 We tried this last night, easy to make and super quick so I liked that about it. The ground beef was bland though not much taste. Husband added ketchup and said it helped, may try adding hot sauce to the meat next time or something. Anyone have any ideas to make the meat not so bland tasting? 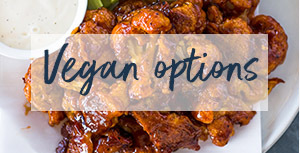 Love the idea of the recipe though good minus the meat issue I had. I think I’m going to make this, but add taco seasoning to the beef. I was wondering if it would be too bland and you just confirmed it. I think the taco seasoning (and maybe some hot sauce) should add some flavor! If you read the recipe it actual says to use taco seasoning and/or fajita seasoning. It would definitely be bland without one or the other!! This sounds delicious, I just have one question. 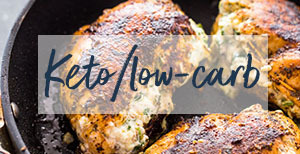 Do you need to drain the grease out after browning the meat? Planning on making this tonight! But I’m curious, are the tater tots still frozen or do you thaw them beforehand? I baked them frozen straight from the freezer. Do let me know if you end up making it! Oh wow! 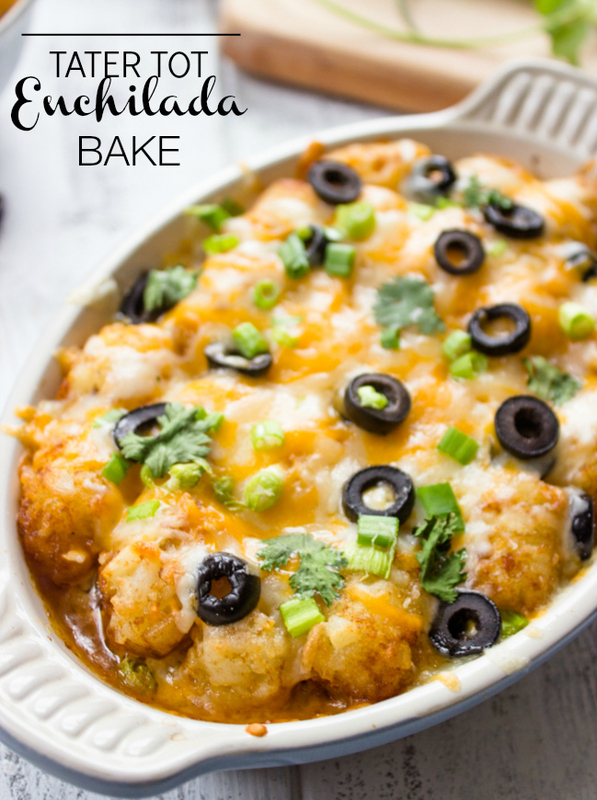 I love the idea of using tater tots here for an enchilada bake!! 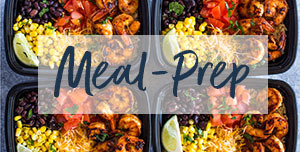 WE love Mexican food as well and it’s always fun to find new ways to make it! 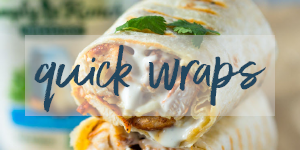 Such a clever twist on enchiladas! I love all that cheese 😀 It looks absolutely delicious!…Pinning! 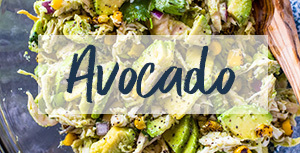 This recipe is seriously genius! I am in love! Looks cheesy and delicious! I’m sure my kids would beg for seconds with this awesome dish.